The weather is cooling down and some of the trees are beginning their color changes....... 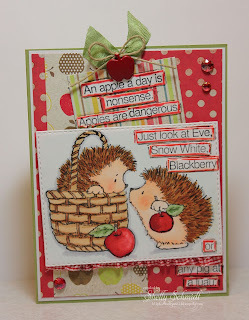 I took the color inspiration for my Sweet Stamps card for our monthly Anything Goes challenge. For my Fall Colors, I used Shades Dye inks (cube/spots) Tank, Butterscotch, Rustic and Brownie. 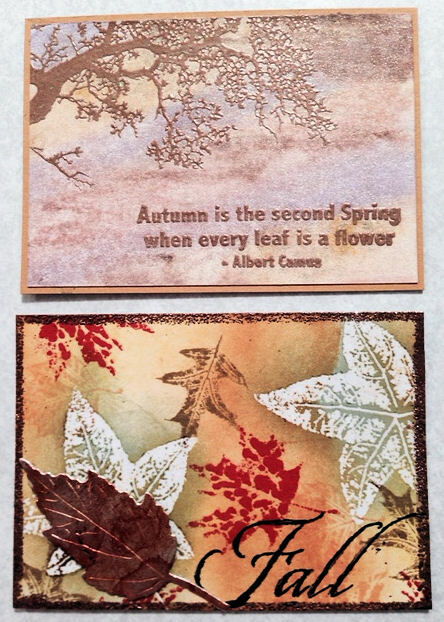 The image is from set Leaves AF4622 and was stamped in Brownie and Tank. I used a dauber to add colors on the card. 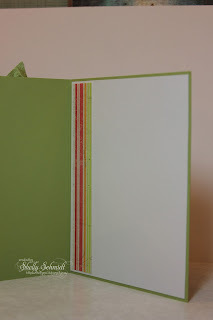 I added a torn color corner using SU Rust and Olive (retired) cardstock. I used Flourishes AF4609 on the rust using Versamark just to add a little interest. The sentiment is from SS4406 Framed Handwritten Words. 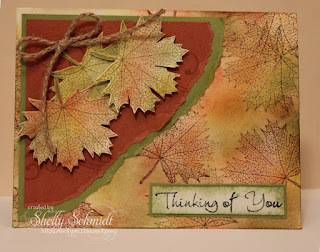 I stamped and fussy cut out a few more leaves and added some twine to finish off the corner. ***Sweet Stamps is having a DT call. It is such a wonderful company- the owner, Stacey, is so good to her DT- I highly recommend this team! And, all of the Sweet Stamps dies and stamps are Made in the USA : ) *** Info for the DT call is HERE Deadline to Apply is Oct 9th. At the Oriental Stamp Art Yahoo group, we exchange ATC's with a theme each month. For September our theme was fans. 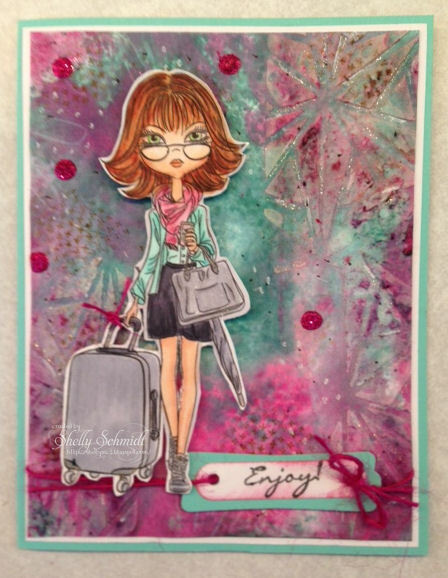 I stamped and embossed my fans and used Pan Pastels to color them in. I then added highlights with Copics and a Stardust Gelly Roll Pen. 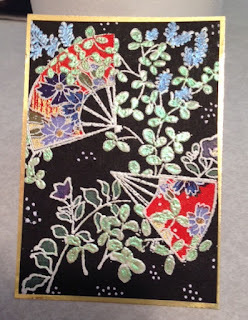 I was not happy with the ATC- looked blah, so embossed a little more of the base cardstock and cut it in strips, then layered on one more fan. The stamps were a freebie with a magazine- Cardmaking and Papercraft. I have joined a group of ladies called the Dueling Darlings-split up into the Diva's and the Dazzlers. 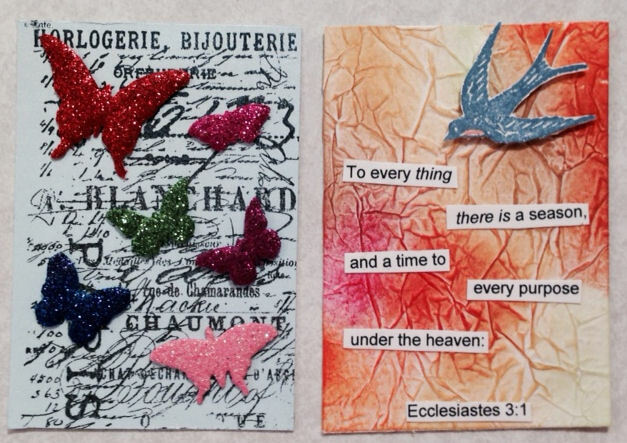 Each month, on the 15th, we create using a card kit that is sent to us. This month, our theme is Tutti Fruity. I am a Dazzler- we used an image from Jeanette, and the Diva's used an image from Kelly. Hello Friends of Sweet Stamp! - Participate in a monthly Anything Goes challenge. - Have the ability to take quality photos of completed projects. - Regularly promote SweetStamps.com on-line in galleries and forums, including your personal blog, facebook, Pinterest and other social media sites. - Support fellow DT members by commenting and sharing their blog posts. 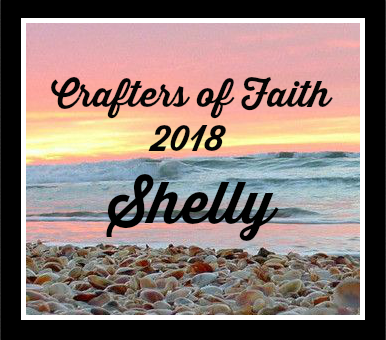 - Mail your creations at the end of each quarter for use on display at conventions. - You must commit to a 6 month term. - A welcome package of products plus a selection of new releases as they become available. 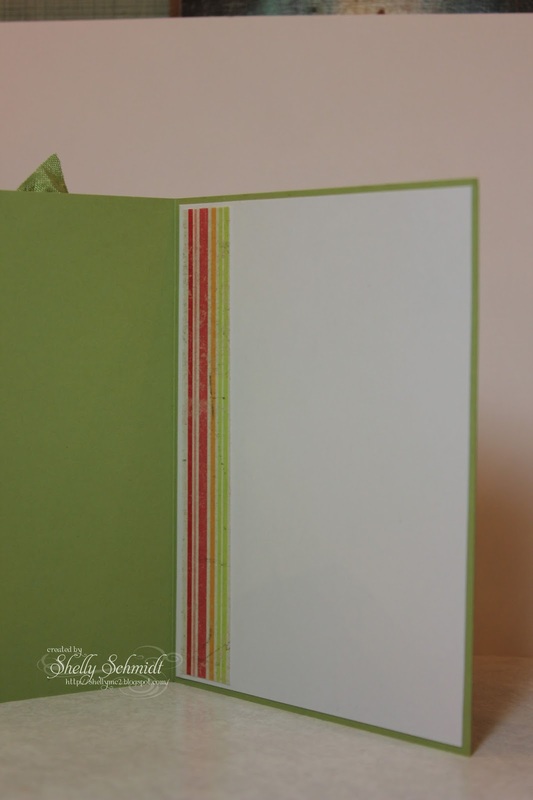 - A $30 monthly product allowance for stamps, stencils and piccolos of your choice. - DT member discount of 30% on all SweetStamps.com & Piccolo brand products, 20% discount on all other items we sell online. - A personalized page on the SweetStamps.com blog which will include a photo, bio and links to your blog and online galleries. 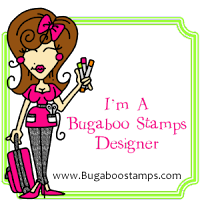 - Your work will be showcased on the SweetStamps.com blog, company facebook page and advertisements and promotional materials. Email the following information to: sweetstamps@yahoo.com with DT Call in the heading. Deadline for applications is October 9, 2015. Due to rising shipping costs, this DT call is open to US residents only, sorry for any inconvenience. I made a card for a friend that just had the fight of her life- and lost the battle...... It was a very quick diagnosis to passing time period for this wonderful lady. I found this stamp set and die at Stampaway at the Our Daily Bread Designs booth. I cut out the center of the die and used a light purple/blue vellum behind the cut out. The image was stamped and embossed with clear EP. I also had a die that did not cut out perfectly, so I trimmed off a piece of that and added it to the bottom. I die cut a butterfly out of a piece of yellow sparkly paper and the top is a purple die cut. I added pearls and a bow and stopped, since this had to be mailed out. The image was colored with Copic Sketch Markers. 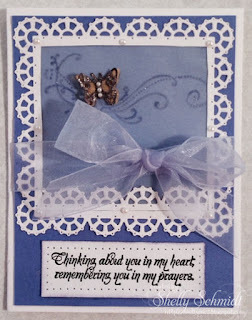 I used the Enjoy stamp from the Deco Frames set for the sentiment. I got inky with Distress Inks for the background in Picked Raspberry, Pine Needles and Evergreen Bough. I tapped it on the craft mat, misted it and dragged the cardstock thru it. I dried it between colors so it did not get muddy. I added background images in Brushed Corduroy Distress Ink and Sweet Stamps white dye ink using the Always on My Mind clear set. 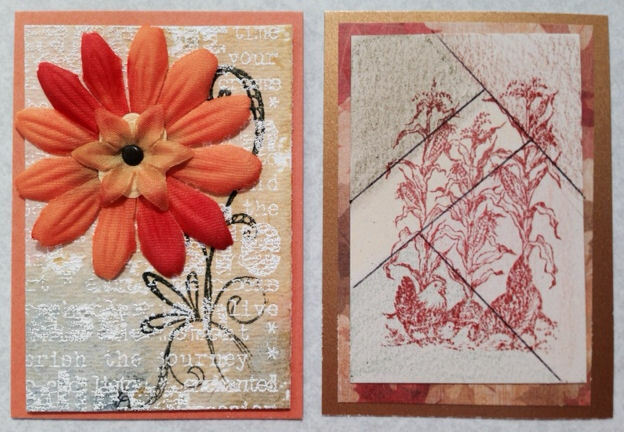 I decided to add texture using the Geo Triangles stencil and White embossing paste. I took a coffee stir stick and dabbed it in the paste to add more texture. I colored the embossing paste with Distress inks once it dried, but I did not like it, so spritzed water on the panel and pressed a piece of paper to it and removed some of the color. I added shimmer to the edges of that with a Sakura Gelly Roll pen. CCEE Stampers- CITY= C- Copics, I-Inked background, T-Twine, triangle stencil, Y- Yellow highlights in her hair and her cell. 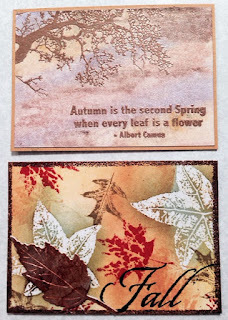 I participated in a Technique Junkies ATC Swap for Fall Colors- we use any TJ technique from Newsletters or any of the CD's. 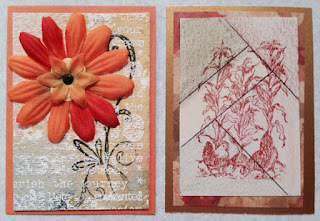 My ATC's were made by using the Plain Technique from the Dec '10/Jan '11 newsletter. I seem to enjoy making a mess and experimenting with color : ) I love this new image from Technique Junkies and had to ink it up.....called Contemporary Floral. Top- Holly Brown-Watercolor Resist 12/08 - so shimmery IRL! Have a Fab Labor Day weekend! 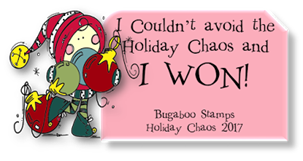 The Sweet Stamps challenge is changing to a Monthly Anything Goes theme. We will have inspiration from the DT each Monday. I had so much fun designing with this sweet new image Daydream Fairy. I colored her with Copics and added some shimmer using Wink of Stella. 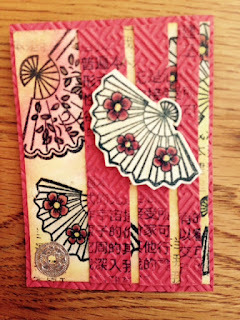 I used a stitched die which I passed thru a second time and cut off some of the length. I had this BG in my stash- this a Technique Junkies technique called Simple Sumi. I added sequins and a button on twine as a finishing touch. The sweet Sentiment is from the Simple Greetings set.